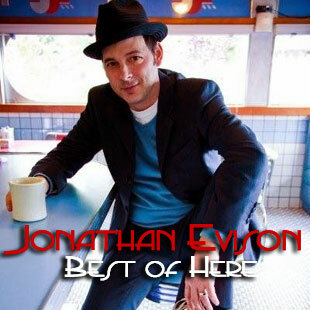 2011 is the Year of the Rabbit, which means it’s also the Year of JONATHAN EVISON. What can top 2009, when he won the Washington State Book Award and a Christopher Isherwood Fellowship? TNB’s executive editor follows up his debut novel All About Lulu with the highly anticipated epic West of Here, is what. And yet JE (as he’s known over at Three [sic] Guys One Book) remains a somewhat elusive figure — even though he was the subject of a short documentary film. What do we know about Johnny? He likes to talk. That much we know. He’s talked to Ron Currie, Jr. He’s talked to Warren Etheredge. He’s talked to publishers (who may or may not listen) and the other guys at 3G1B. He’s even talked to himself. His family is weirder than your family. No, really. His grandparents were fascinating. Speaking of his family, he’s an unabashed mama’s boy. Like Melville, he’s been to the Galapagos; unlike Melville, he has not dined upon turtle. He likes Daffy Duck. And beer. And rabbits. And his book is the Book Club selection for this month. So when we get him in the chat room, we can ask away! The Nervous Breakdown is an online culture magazine and literary community. It was founded in 2006. Our masthead can be found here.
. . . this is getting a little embarrassing . . . i’m afraid people are gonna’ get sick of me . . . but i promise to use all this hype for the forces of good! . . .thanks TNBers for being such a great support system to one another (and to me!) . . . I happened to be at the U. Village Barnes&Noble today, looking for a copy of Beezus and Ramona with my daughter. Not ten feet away, Ron Reagan Jr. was reading from his new book. There was a big stack of West of Here in his sight line. He looked up from a passage about Ron Sr. having a new aircraft carrier named after him, and there was intimidation in his eyes….just saying. you’re a very funny man, sean . . .
give it another week, tom . . .
Jonathan – It’s about time we saw your lovely face here! Yay! Cannot wait for WOH!
. . . thanks, zara, can’t wait for you to get your hands on it (WOH)! Dude. March of Crimes!!! Ha! That’s just cool. Also, Sean IS a very funny man.